Gorgeous cabriole legs support our Evendale Court Display Case. This cabinet would be a grand addition to your formal entertaining space or dining room. Traditional Queen Anne styling is exposed in our Evendale Court Display Case. Heirloom worthy, your exquisite china display is topped with a catalyzed conversion varnish that resists water, wear, and yellowing. This solid hardwood pottery pantry features durable dovetailed drawers, fluorescent lighting, glass shelves, and concealed door hinges. 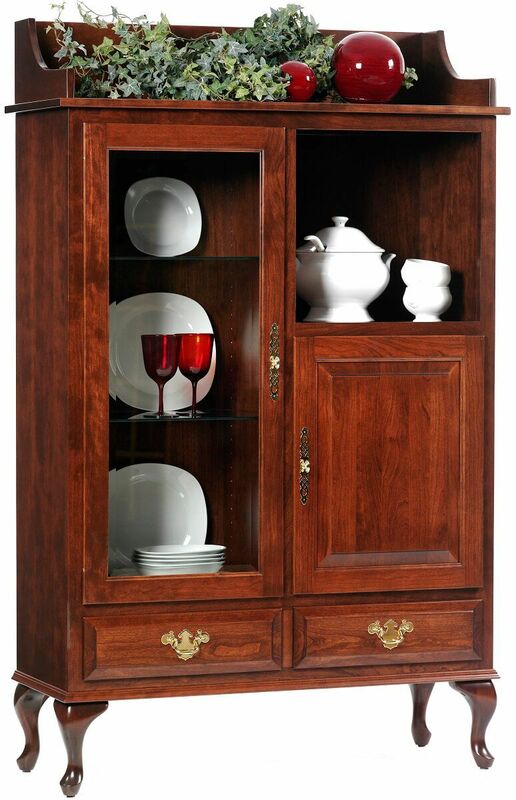 Shown in Cherry, this regal display case can be ordered in a variety of hardwoods and stains. Trust your custom fine furniture to Countryside, and our artisans will handcraft the perfect Evendale Court Display Case for your dining room.